I have heard about ALEKS over and over, and looked at the website, and finally took the plunge and used a free month trial code for Connor earlier this summer. Before that trial was even up, I found out I'd be reviewing ALEKS for the Crew, which meant a one-month trial for my three oldest (3rd, 5th, 7th) and for myself. I've been leery about trying ALEKS for a number of reasons. The big one, to be honest, is sticker shock. I just knew the kids would love it, and at $20/month for one student ($100 for six months, $180 for a year), it scared me to find something else to feel guilty about not providing. There are family discounts, on the 6- or 12-month plans (all three boys would be $240 for six months, for instance). So what is it? ALEKS is an online subscription to research based math instruction, ranging from 3rd grade to college level math. You need an internet connection, and it works on either Mac or PC. At the high school and college level, there are also courses in business and science. For college, the have an arrangement with ACE for obtaining college credit for the coursework. How does it work? Well, first you assign the child a course. They can only be in one course at a time, but you can easily move them from one course to another. You lose all information about the previous course when you do that, so you would want to print out reports and such. As they start working through individual topics, they are filling up their pie slices. All three of my kids (and me!!) found this motivating and encouraging. It is fun to see the slices get colored in. Periodically, the program will provide a new assessment, where the student can end up with topics being put back on the "ready to learn" list to be repeated, or the student can move ahead significantly if the initial assessment didn't really place them appropriately. Once a student assesses at 90% or more of the course content, an email is sent to the parent account, so you know that the student might be ready for a new course. The student also gets a "you're doing great" email at that point. In doing new topics, the student can choose to access written instructional material that teaches the topic by walking him through the problem that was presented. The instructional material is solid and fairly traditional in presentation. Then the student can "practice" by generating a new problem to solve. The student can choose to back out of the topic and try something different if they aren't understanding it. Okay, that's the theory. Now how does it really work? Well, I have a few criticisms here. First, for my oldest, we had a really tough time getting him placed into an appropriate level course. He just completed 6th grade, and while he is really strong at math, I know he has some areas where he really needs some practice. So, I started him off in the Middle School Math 1 course. After completing the assessment, he started working on the "ready to learn" topics, and all of them were incredibly easy. He was not being challenged at all. I looked everywhere to try to figure out how much overlap there was between the various courses, but without printing out detailed topic lists for each course and comparing them myself, it was hard to tell. The answer, after a few hours of combing through the topic lists -- there is a lot of overlap. A lot. We skipped him up to Middle School Math 3, where he still ended up mostly reviewing things he already knew. I manually assigned him additional assessments (very easy to do!) to help bump him up to an appropriate level, but it still took quite awhile to get him to a point where he had any choices that he truly needed to work on. After he hit 90some % in Middle School Math 3, I skipped pre-algebra and got him started in Algebra I. After the first assessment there, he did actually have a topic or two the program felt he was "ready to learn" that he & I agreed that he did need to work on. In other words, it took us roughly 35 days to get him to the point where he was getting some value from the program. Now part of that was me. I should have been more aggressive in moving him up, or in giving him additional assessments, or something. But I couldn't easily tell how much the levels overlapped, and I was worried that he had missed things. Had I started him off in Algebra I, I would have found that it does in fact contain plenty of the easier materials too, so if a student is missing the foundational aspects of some topic, it will back them up and have them work through that. Once Connor got to the "right" level for him (I still think it is a bit on the easy side), the program has been fantastic. He enjoys it, I love the reporting, we both love watching the pie fill up. How do I know what my kids are doing? The reporting functions in ALEKS are fantastic. You can log on at any time and get a look at their pie. That also lets you see what topics they have mastered, and what topics they are "ready to learn" next. There is also an attendance report that you can check, which shows how long they were logged in, how many topics they attempted, and how many topics they mastered, by day. And, you can get an email as frequently as once a week that gives you a pretty good snapshot as to where they stand. You can also run a report that shows how they compare to your state standards. What about the elementary levels? I'm not sure that I would find the 3rd-5th grade levels to be worth the cost for many students. My elementary kids are pretty intuitive with math, but are at (or below) grade level for reading. So what I'm finding in the elementary courses is that either my kids are doing things that they already know how to do, OR they need me to read (and teach from) the textbookish explanations provided by the program. I cannot let them log on and just do math -- I need to be available, for the most part. It seems to me that the reading level of the explanations is too high for the math level. So a child who is reading at a 5th grade level but doing math at a 3rd grade level might find the 3rd grade ALEKS course to be about perfect. Middle School? Well, as previously stated, there is a lot of overlap between the various Middle School courses. But there is a lot of overlap between middle school math levels in traditional textbooks as well. 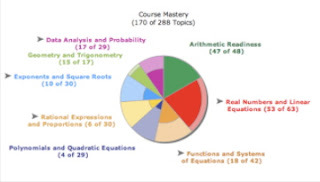 If you have a child working at a middle school level, I'd take a good look at the topics they have mastered, and those they are "ready to learn" and not hesitate to move up to the next course before hitting 90%. I think if they score anything above about 50% initially, and in looking at the "ready to learn" materials you know that is almost all review, I'd put them into the next course. For instance, I went in and did Middle School Math 2 (7th grade) myself. I feel reasonably certain that of the 30some questions on my assessment, the only one I missed was one that had us converting miles to kilometers (my answer would be... look it up! This is not something I have memorized! ), yet I scored 82%. Of the 34 things that ALEKS says I am ready to learn next, two involve converting metric measures. None of the other 32 items was on the assessment, and I know I can do all of them. If I were "my parent" in this case, I'd probably either skip me ahead to Middle School Math 3, or have me do the two metric conversion topics, see if more metric things pop up, and then skip ahead. High School? We've tried a number of the high school courses. Both Connor & I have worked in Algebra I and Geometry. I worked through both Financial Accounting courses and Business Math. I think the high school material is excellent, the descriptions are basically good, and my only real complaint would be that you can't be in more than one course at a time. It would be nice to be able to be in both Algebra 2 and Chemistry, for instance. Elementary levels -- I think in most cases, I wouldn't encourage people to get ALEKS long-term for elementary ages. If you have a strong reader, I could see this being an option for a couple months at a time (like maternity leave!) Or if you are at a point where you are considering hiring a math tutor, this would be a great alternative, particularly if you can be accessible to help to explain the provided explanations. For me, since I have to do the teaching either way, I will stick with far less expensive (and reusable) texts. Middle School -- in many cases, I can see ALEKS being a great option at this stage. The student should be able to be fairly independent here. The program will let the gifted math student cruise ahead, yet it will make them practice in those areas that need it. Or it will provide plenty of examples and practice for students who don't get math quite so easily. Being able to choose from a subset of topics gives students at either end of the spectrum some control over their learning, which is a good thing at this age. High School -- I think this is where ALEKS starts to shine. Being able to focus on the aspects of Algebra, Geometry, or more advanced math that you really need to work on, and to not have to spend time on the things that come easy to you... I love that. You can see in Connor's pie chart above that he has three area slices that are nearly filled. So he can work on exponents, polynomials, and proportions -- and not spend his time doing the arithmetic, geometry or linear equations. College -- okay, I haven't played here much yet (I'm having way too much fun reviewing geometry -- NOT -- but I do really and truly need this refresher) and I do plan to update my review to include more here. But the variety of courses available is fantastic. Basic Math through Precalculus, Statistics, plus prep courses for everything through Calculus. Plus a handful of accounting and other business courses. Plus chemistry. And nine of the courses can be done for college credit, not that I understand that system exactly. Parents -- now, this had NEVER occurred to me, but now that I have had the chance to do a trial month, this is something I would highly encourage. One concern I have had as a homeschool mom is that I never really understood geometry. And I have a son rapidly approaching that subject. There are things I've forgotten from algebra too (exponents of exponents, negative exponents, simplifying the square root of 54 without a calculator, etc.). I was able to complete Algebra I in a couple days, and after a couple weeks, finished Geometry. If I were doing this for myself, I would next move on to Algebra II, which I suspect I could finish before my month is up. Instead, for the sake of this review, I've done both high school Accounting courses, and I'll be poking around in some of the other courses -- statistics, business math, and probably some of the college level ones. Watch for an updated review :) I'm a huge proponent of "teacher training" for homeschoolers, and if you would be able to find a half hour a day for a month, you could really brush up on your math skills for $20. Very affordable continuing education, I think. I haven't even mentioned QuickTables, which is a separate part of the program used to drill the basic math facts (addition, subtraction, multiplication and division). This is part of ALEKS for the elementary and some of the remedial levels, but can be turned on in the parent account for any age. This program works on getting the kids to learn their tables, and you get to watch the individual facts turn color as you master them. Mastering more of the table also unlocks some games (that also make them work their math facts), which my kids like. For my family, I think we are going to let our account expire when the trial is up, and then look seriously at starting up again for a month or two when we are between math levels. And hopefully I'll be able to do that for me, too. Once Connor completes Algebra II, I'll be looking very, very seriously at getting him a subscription "for real" so he can work through Precalc, Trig, AP Statistics, etc. Wow, did that in my head and it has been over 20 years since highschool maths. Must admit I loved Calc, Trig and Algebra. They were like fun games for me. I really appreciated your review. My eldest is working successfully thru SM on his own and appears to be teaching himself due to its steady development so I wasn't sure if Aleks wld be much use. Is SM good for higher levels after 6? Jen -- very good!! Once I read the little explain page, it all came back to me, but in the assessment, I stared at it in total confusion. It was the same for exponents -- when do you add them? when do you multiply them? We did try NEM, and while I like it, I don't know. Maybe we should have stuck with it, but it is really the first math program where I have had to really push to get Connor to do the work. It wasn't that it was too hard (it was actually easier than what he had been working on when we switched). I don't know what it was, but I doubt NEM is going to work for any of my kids. I've read good things about some of the other jr. high SM products though, but we're not spending the money right now.